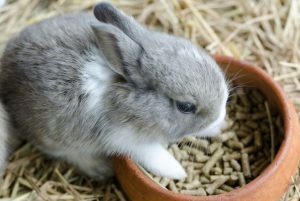 If you are considering adopting or buying a rabbit, and you have already decided on the breed of rabbits that you like and bought an indoor home for your bunny, it’s time to answer the important question: what to feed your pet rabbit? For a healthy rabbit diet, hay is by far the most important component. In addition, rabbits eat pellets, fresh vegetables, and fruits and they also need a constant supply of water. So first and foremost, hay, hay and some more hay. This crucial component of a healthy diet for your fluffy companion should constitute about 80%. The other 20% is made out of pellets, fruits, and vegetables. Getting to know what to feed rabbits is not difficult but once you learn what rabbits eat you need to stick to the recommended diet in the right proportion of hay, pellets and fresh foods in order to make sure that your bunny stays in good health. The most frequent mistake is feeding your bunny way too much pellet food and giving them too many treats. Don’t make a mistake of feeding your bun pellets and mixes which contain too little or too much nutritive value. Fresh hay is the most important component in your bunny’s diet. You need to provide your pet with a constant supply of fresh hay. You can feed your fluffy pet Timothy, Orchard, Wheaten, Oaten, Paddock, Pasture, Meadow, and Ryegrass hay. Alfalfa hay has a higher protein level than other hays. Since it’s more fattening, you should only serve it to underweight or growing rabbits. When trying to check if the hay is good, inspect its color. Good and fresh hay is a pale green to pale gold color. If the color is dull and brown, there is a chance that the hay has been rained on during the process of drying. As regards the optimal daily quantity of hay, you can serve your bunny a portion of hay which is about the same size as their body. Serving your bunny sufficient amounts of hay every day promotes healthy digestive function and proper diet. Another benefit of hay is that it is rich in vitamin A, so you don’t need to worry whether your bunny will get enough vitamin A from fresh foods. Good quality hays from trusted brands are affordable and readily available. They usually come compressed so, once you open the bag, don’t forget to keep the hay well ventilated so it doesn't get mold. A cardboard box is a good and practical option for hay storage. 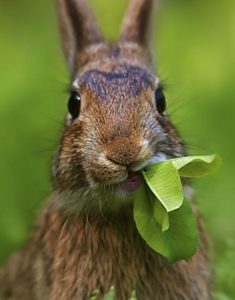 What do rabbits eat apart from hay? Well, they really like pelleted bunny food. Proper portions of pellets are ¼ to ½ cup of pellets a day for a 5 to 7-pound adult bunny. Rabbits which are overweight will need restricted pellets while babies and growing bunnies, as well as underweight rabbits, should be offered larger portions of pellets together with hay, fruits, and vegetables but only the sorts which have been proven to be safe foods for rabbits. What can bunnies eat is no mystery and there are tons of reliable sources of quality advice as regards bunny diet. The type of pellet served to rabbits depends on their age. Alfalfa-based pellets should only be fed to rabbits under 7 months old. Timothy-based pellets are beneficial for rabbits over 7 months old. However, it all depends on the nutrition values listed on the back of the bag. Both types of pellets can meet nutritional requirements for rabbits. However, alfalfa-based pellets have more calories, protein, and fat and less fiber than timothy-based ones. In addition, good pellets do not include whole dried fruit, seeds, nuts, or other colored crunchy things. They should only contain pelleted hay and herbs and nothing else. 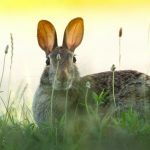 One problem is that each type of seed or ingredient has different nutritional content, and bunnies develop preferences for certain seeds or pieces. 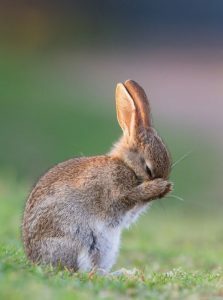 Rabbits then become picky eaters and they can easily develop a nutritional deficiency by only eating certain parts of mixed food. What else can a rabbit eat? Fresh foods such as fruits and vegetables are also an important part of a healthy bunny diet. Try to vary a minimum of three types of greens every day. Each type of vegetable will provide not only different nutrients but also different chewing motions to aid with tooth grinding and also add a variety of tastes to make eating more enjoyable. Because of many pesticides used throughout the growing process, it’s very important to thoroughly clean all fresh foods before serving it to your furry friend. A good guideline is to feed a minimum of 1 cup of vegetables for every 4 lbs. of body weight per day. Don’t forget to introduce one vegetable to the bunny diet at a time. Watch for any unwanted effects and leave out that food if it causes soft stools or diarrhea. Remember that you shouldn’t be introducing any fresh foods to your bunny until it has been eating grass hay for a minimum of 2 weeks. 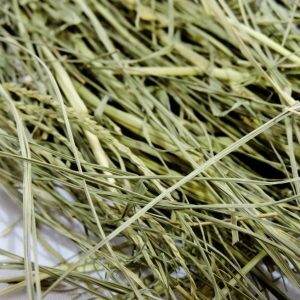 The grass hay will help get your rabbit’s GI tract in good working order and help it accept new foods more easily. In addition, you should limit fruits to 1-2 tablespoons per 5 lbs. of body weight and only stick to high fiber and low sugar fruits. Sugary fruits such as bananas and grapes should be used only as occasional treats. 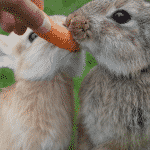 Rabbits have a sweet tooth and if you let them, they will eat too many sugary foods instead of healthy ones. Don’t feed your rabbit crackers as they are high in carbohydrates. The same goes for bread, pasta, pretzels, cookies, chips, or cereal. Although branded for rabbits, many commercially-sold bunny salty treats are high in fat and sugar, such as yogurt chips, and should not be given. You should leave out fatty and sugary food from your pet’s diet. Foods high in starch and sugars will eventually cause a number of gastrointestinal tract diseases and abnormalities. In addition, you should avoid grains of any kind and legumes for the same reason I mentioned above. Starchy root vegetables and fruits in too large quantities will become a huge problem because of their high content of sugars and starch. This is why these foods should only be served moderately and infrequently. You should definitely avoid foods in the onion family (like leeks, chives, and onions) as they will cause blood abnormalities in bunnies. Do be careful when buying commercial bunny food and always check the ingredients. This will help you avoid low-quality and probably bad food for your bunny. Look for recommended healthy ingredients which will keep your rabbit healthy. With so many proven and trusted brands, there’s no need to experiment with no-name knockoffs just to save a few bucks: you will spend hundreds of times that much later on paying vet bills when bad diet finally takes its toll. 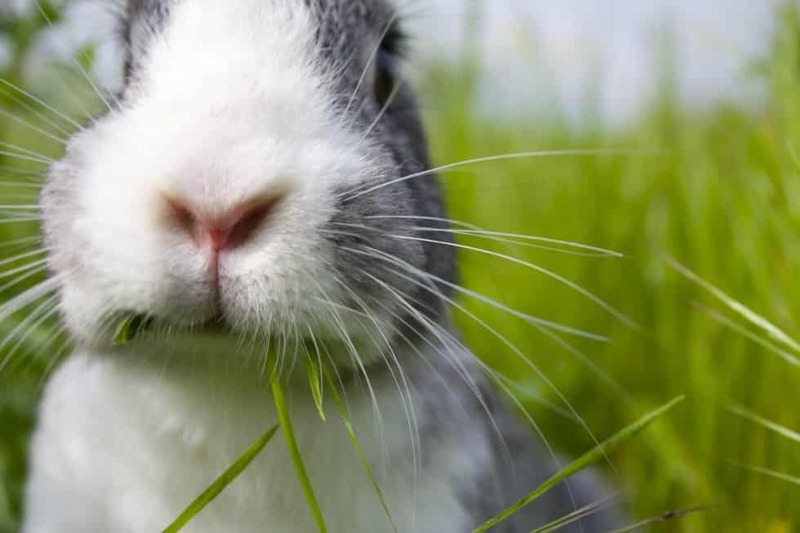 Also, bear in mind that serving muesli-style diets to rabbits is associated with abnormalities which can lead to painful dental and digestive problems, lower gut motility, selective (picky) eating, obesity and urinary tract stones or sludge. The vitamin and mineral supplement comes in powder form, so it is usually incorporated into the compressed grass-based pellets. These pellets are the least palatable ingredient of muesli mixes so most rabbits do not eat them and they are left in the bottom of their food bowl until you throw them away. In doing so, you are actually discarding the vitamin and mineral supplement the pellets contain. 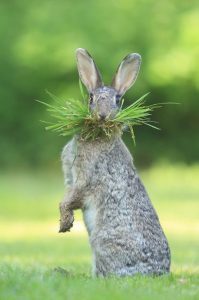 If young rabbits do not get enough calcium, the bone surrounding the teeth gets weakened so that the roots of the teeth press on the nerve supply to the teeth when the baby rabbit tries to eat harder food, such as hay. These picky rabbits which have gotten used to soft ingredients in the muesli-style mixes never eat hard food so the owners falsely come to the conclusion that their bunny doesn't like hay. Some mistakenly decrease the hay portion of their bunny’s diet and make things even worse. So, that's all for now! We hope we've helped with the essential info on what are the best foods for a healthy bunny! Don't forget to read our full guide to how to take care of a bunny!